LOGAN, UTAH, USA — Utah State University physics professor David Peak is the 2018 recipient of the national Council on Undergraduate Research-Goldwater Scholars Faculty Mentor Award. Selected from 10 finalists nationwide, Peak has mentored, to date, more than 30 USU undergraduates, who have received a phenomenal 36 Goldwater Scholarships and Honorable Mentions — a number that rivals Ivy League competitors. Peak will be formally recognized during the Biennial Conference of the Council on Undergraduate Research July 1-3, 2018, in Arlington, Virginia. As part of the award, USU's undergraduate research program receives a $5,000 gift. "Utah State University is thrilled David Peak is receiving this well-deserved national honor," says USU President Noelle Cockett. "Professor Peak has tirelessly mentored undergraduate researchers throughout the university and guided them in successfully competing for prestigious national scholarships and recognition. He epitomizes the aims of our land-grant mission in providing world-class learning opportunities for our students." "The Goldwater Foundation is pleased to partner with CUR to celebrate faculty mentors, who have helped their students achieve one of the most prized awards an undergraduate majoring in science, engineering and mathematics can achieve, a Goldwater scholarship or honorable mention," said John Mateja, president of the Goldwater Foundation, in a release. "David Peak is an exceptional undergraduate research mentor, his educational leadership at the national level is longstanding and he sets a high standard to which all of us should aspire." CUR Executive Officer Elizabeth L. Ambos calls Peak "an outstanding physicist, teacher-scholar and highly effective mentor." "David Peak has nurtured the careers of hundreds of students," she says. "His wider contributions to undergraduate research programs at USU, as well as CUR, mark him as a foremost innovator within the undergraduate research movement." 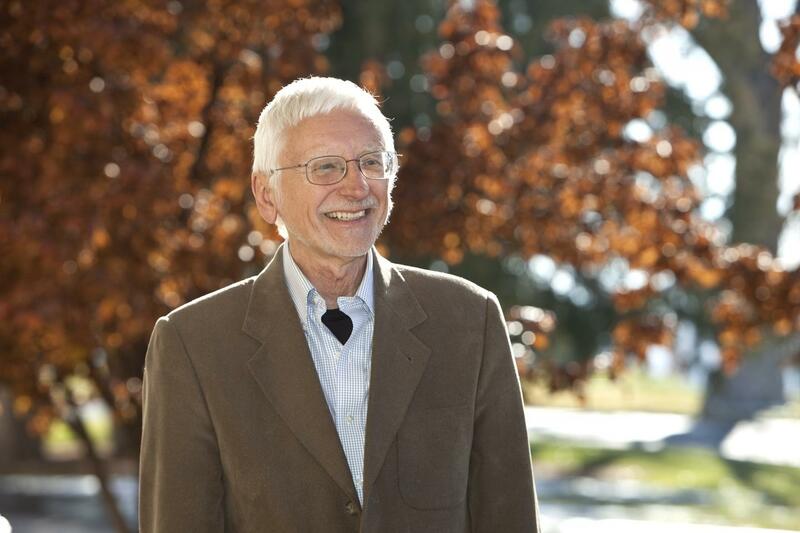 Peak was an early leader of the National Conference on Undergraduate Research, a co-founder of the CUR Physics and Astronomy Division and has helped to foster USU's renowned, campus-wide Undergraduate Research Fellows program, the nation's second oldest. "David Peak provided me with the background and inspiration to create a plan for a centralized undergraduate research program at USU," says Joyce Kinkead, USU professor and former associate vice president for undergraduate research. "He consistently pushes for efforts that provide students access to meaningful, authentic research experiences and enhance the competitiveness of our students for prestigious awards and scholarships." Nearly two decades ago, Peak established, what he calls, a "scholarship boot camp" to equip outstanding undergraduates with the skills to pursue national scholarship opportunities. Since 2001, his boot campers, in addition to the Goldwater awards, have received a Rhodes Scholarship, a Rhodes Finalist citation, a Fulbright Student Scholarship, a Marshall Scholarship and a number of National Science Foundation Graduate Fellow recognitions. With wife Terry Peak, professor of social work at USU, Peak established an endowment in 2008 to fund annual outstanding undergraduate research awards called "Peak Prizes in Undergraduate Research" to students from each of the university's seven colleges and from a regional campus. In 2009, Peak was one of 40 professors across the nation named a Carnegie Professor of the Year by the Carnegie Foundation for the Advancement of Teaching and the Council for Advancement and Support of Education. "I cannot think of a more deserving 2018 CUR-Goldwater Scholars Faculty Mentor Awardee than Physics Professor David Peak," says USU Science Dean Maura Hagan. "His devotion to our students is legendary, both as a teacher and a research mentor. I am particularly grateful to Professor Peak for his tireless advocacy for undergraduate research opportunities that enhance our students' educational experiences."